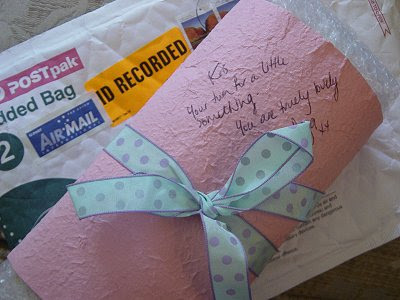 Today I received a little package in the mail from a very special friend in Australia who makes the cutest monkey softies (among other things). Receiving a package in the mail in itself was very exciting, as usually it's Symon receiving packages of random items he has bought from Trademe when I'm not looking! 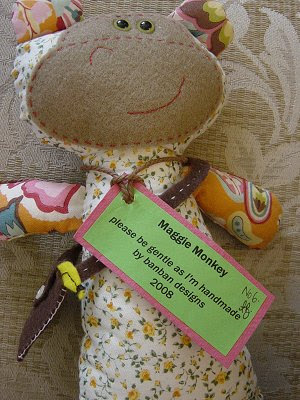 I was so excited to find that she had made me one of her gorgeous monkeys (Maggie Monkey). 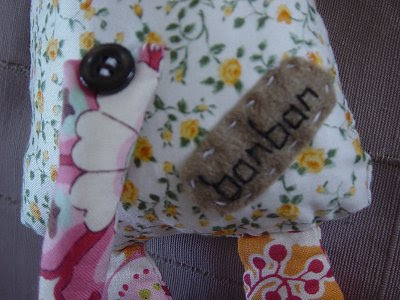 It is sooooooo cute, with paisley and floral fabric and the cutest little tail with a button sewn on. I also love it's tiny bag with a banana in. Thanks so much Anya - you made my day! Check out Anya's blog (here). OOoo that is totally cute! Hey, there's absolutely nothing wrong with Trademe! Part II of my cooking tips coming soon btw. Fantastic. I'm to totally envious!